Iran and Saudi Arabia are actively expanding their fight from the Middle East to Afghanistan. Iran is negotiating a nuclear deal with the Western powers and Saudi Arabia has long been a strategic ally in the Middle East, but the two countries, representing the rival Shia and Sunni sects of Islam respectively, will continue to remain troubling players in the region as long as Iran’s leadership remains unwavering in the belief that their interpretation of Shia orthodoxy is exportable outside their borders and troubled nations like Iraq, Afghanistan, Yemen and Syria remain convenient battlegrounds for proxy war. A recent report reveals that Iran’s Revolutionary Guard Corps and Ministry of Intelligence are actively recruiting Afghan refugees to fight in Syria in return for a monthly salary and legal residency. Video posted by Syrian rebels shows handcuffed Afghans, confessing that they were recruited and transported by Iranian officials to fight in Syria to fulfil their religious obligation – defending Bashar al-Assad’s Shia government – and received a financial benefit. Although the presence of Afghan refugee fighters in Syria has long been known, it seems that recent developments in the region, including military successes by the Islamic State and Syrian rebels and Saudi Arabia’s Operation Decisive Storm in Yemen targeting Houthis militants have accelerated the pace at which Afghan refugees are being armed. 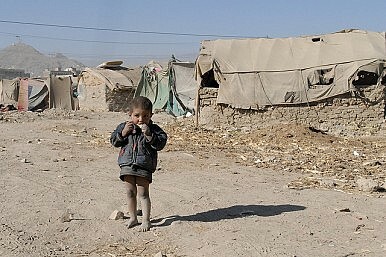 Iran’s recruitment of Afghan refugees comes at a time when the Taliban, allegedly supported by Pakistan and Saudi Arabia, have shifted their war tactics in Afghanistan, with the indiscriminate slaughter of Afghanistan’s Shia population to intensify sectarian violence. Recently, the group has kidnapped 31 Shia Hazaras and beheaded several others. Information on how many Afghans are currently fighting in Syria or are in Iran’s training campus awaiting deployment is hard to obtain. However, the use of an extremely vulnerable refugee population, living in Iran in hope of finding work, is a disturbing exploitation of human suffering by a religious government that proselytizes morality and ethical standards to its citizens and followers in the region. The recruitment also includes Shia from Pakistan. Recently, seven were killed in Syria and buried in Iran. Since the Islamic revolution of 1979, Iran has been jostling with Saudi Arabia for supremacy and leadership in the Muslim world. Although the two countries have not engaged in direct conflict, they have launched and financed some of the bloodiest proxy wars in the region, with Iran blatantly exploiting not only Shia, but any domestic dissident groups vulnerable to its sophisticated propaganda machine. The current recruiting of Afghan refugees, however, is serious not only in humanitarian terms, but also for the potential ramifications, particularly in Afghanistan where the insurgency already poses an existential threat to a shaky unity government. Iran and Saudi’s rivalry is not limited to the military sector; it also extends to the religious and cultural areas. Recently, the Saudi government signed a $100 million project to build the largest mosque and Islamic Center in Kabul. The 18,000-square-meter facility can enroll 5000 students and accommodate 15,000 worshipers. Iran, on the other hand, is said to be giving out an annual amount of $100 to Afghan media and religious madrassas and mosques to support Iran’s anti-West campaign. Among the key Iran-funded projects is a three-acre Khatam Al-Nabyeen madrassa, built at a cost of $17 million, several newspapers, and the Tamadon TV network. The Saudi ambassador to Afghanistan, Mesfer bin Abdul Rahman Al-Ghaseb, said that the new project aims to “counter terrorism and foster peace with the help of Pakistan” in Afghanistan, but funding large-scale religious madrassa construction is obviously not Afghanistan’s top priority, given its crumbling economic and political situation. The madrassa construction project, which was first initiated by Saudi Arabia and Pakistan in 1980s and 1990s, has profoundly institutionalized religious violence and nurtured the radical generation of today’s Al-Qaida and the Taliban. Unlike Pakistan and Iran, where sectarian violence routinely takes a human toll and religious minorities are systemically subjugated by state apparatus, Afghanistan has largely avoided sectarian division, with both Shia and Sunni Muslims demonstrating tolerance in regard to the fundamental religious issues, including commemorating major dates on the Islamic calendar. Post-Taliban politics in Afghanistan is defined more by ethnic and class politics, than it is by sectarian rivalry. In the event of sectarian violence, the people of Afghanistan have stood together, which is promising. But this resilience is challenged by the growing sectarian conflict abroad. Since taking power last September, President Ashraf Ghani has pursued a relentless diplomatic effort to reach out to the Taliban through Saudi Arabia, Pakistan and Iran. The recent wave of violence, however, is showing that Afghanistan or any crisis-prone nation will continue to suffer as long as its plight and humanitarian situation benefits rival powers, which may exploit human suffering for their vision of regional hegemony. The Iran-Saudi proxy war is sending a terrible message to all parties engaged in Afghanistan, the Middle East, and the war against terrorism. Further militarization of the region will seriously challenge the prospects for peace and stability. Iran has already formed an estimated army of 70, 00 to 120,000 to fight the Islamic State. Although there is an overlapping interest to defeat the extremist group, the next legitimate concern will be the future of this large, armed militia established along sectarian lines. As the Western powers negotiate a nuclear deal with Iran, the fate of Iran and Saudi’s proxy wars must be included in the talks. Without immediate diplomatic progress to contain sectarian rivalry, the region will continue to suffer.